Complete sporting seat with cover made of GRIP in the sitting part, a good non-slip, asphalt weave material which let you have a good grip on the seat and at the same time change easily position. A double red or blue stitching divides the GRIP part from the side parts made of carbon effect material to exalts the elegant and sports look of BMW motorbike. The rear part is made of white Crystal material, in this way the seat become an integral part of the motorbike. WARRANTY: 1 Year, only for manufacturing fault. 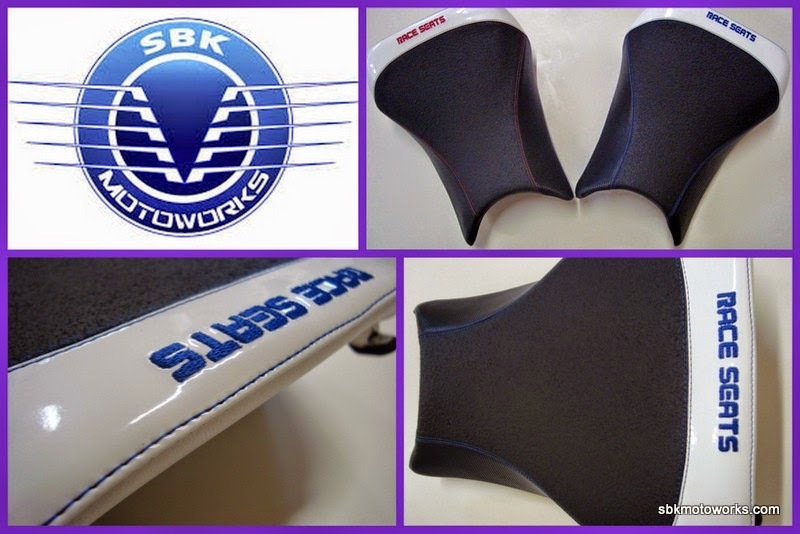 SBK Motoworks : Many of our S1000RR 2010/2011 customers who converted to our 2012/2014 fairing kits have an issue with the seat to match with the latest model. Now with this Race Seat you are now can get full complete look of the new latest model 2012/2014. For those who ride S1000RR/HP 2012/2014, this Race Seat will be the best option for you. Whether for your Race, Track and Normal riding. It's handmade in Italy by our partner Race Seat. No compromise on the quality and it's the same company that provide the seat for Sylvain Barrier in WSBK!